Uluru: Even the name sounds mysterious, grand, remote, awe-inspiring. 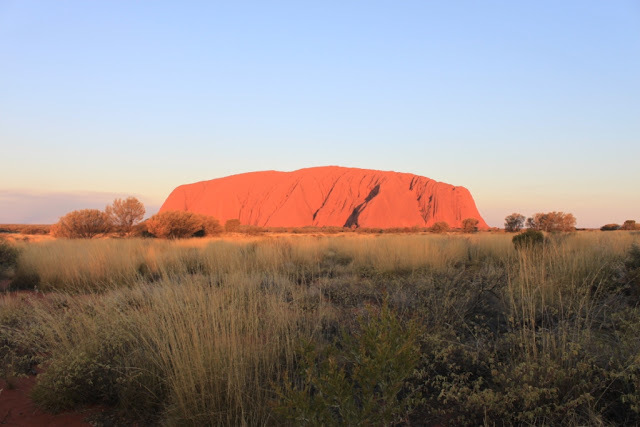 A red rock rising nearly 350m out of the desert plain, hundreds of kilometers from anything and anywhere – surely the most recognisable natural attraction in the entire country. No matter how many postcards you’ve seen, Uluru is still breathtaking, particularly up close, where the fissures in the rock look like pockmarks on suede and its colour deepens as the sun goes down. It’s big, sure – 3.6km long by 2.4km wide, and old – around 600 million years they reckon. But it’s not the size that matters, on this occasion anyway. There are plenty of other big pieces of rock in Australia. It’s partly the fact that it’s such a surprise. There is literally nothing else around it. The Olgas, a small group of hills that look like something out of a story book by Dr Suess, stand some 70km away, and there’s Mt Connor, an even larger, flatter mountain that many visitors mistake for Uluru as they head towards it. But in an area that comprises hundreds of thousands of square kilometers, that still adds up to two-thirds of sweet nothing. It has been of huge significance to Aboriginal people for millennia. 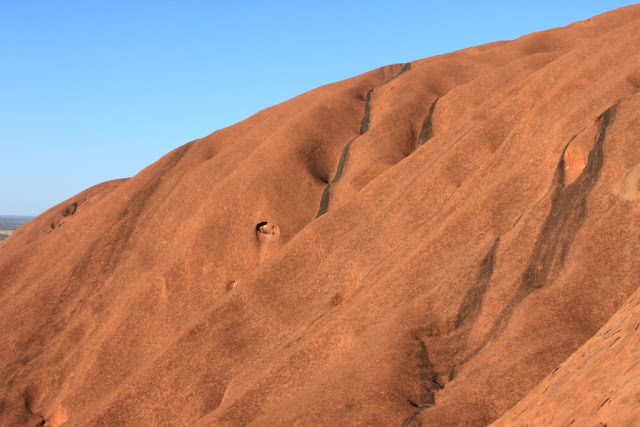 The traditional belief is Uluru was created by two boys playing in the mud. And it’s also the journey itself. Even Alice Springs, the geographical centre of Australia, is still 400km away. It seems to take forever to drive there. And much, much longer to walk. Perhaps that’s why Uluru has attained such mythical status. For if it’s still possible to undertake a pilgrimage to the heart of the Australian dream in the 21st century, Uluru is such a trip. It’s a rite of passage for young Australians, and a bucket list opportunity for the grey nomads. 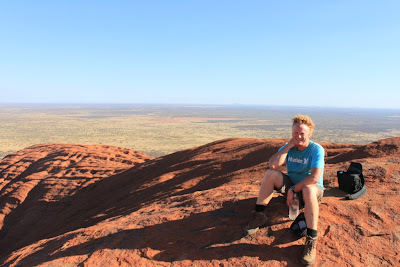 Tourists flock here, backpackers congregate in their vans alongside the road to gape in awe, 4WDers combine it with a trip through the Simpson and Tanami Deserts. And like any good pilgrimage, it has controversy. To climb, or not to climb? That is the question. The Aboriginal custodians of Uluru, the Anangu, ask you not to. Signs everywhere plead with you not to climb the rock. To them, it’s a culturally insensitive. 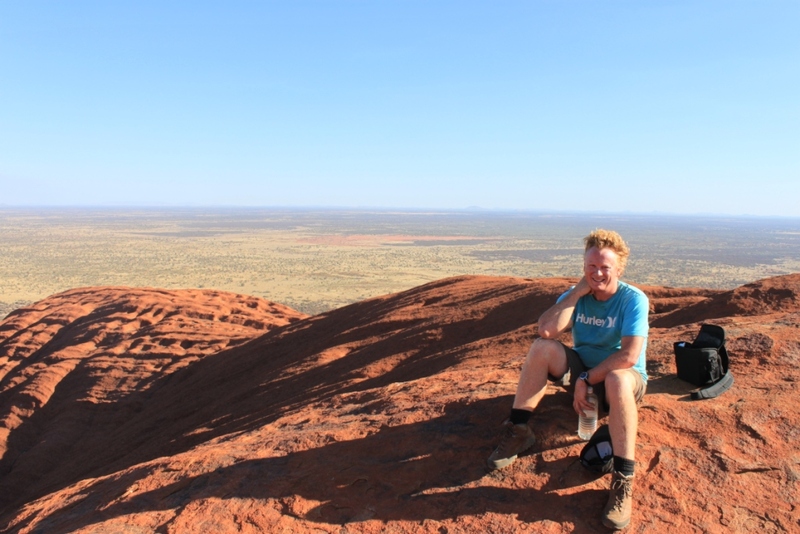 To non-aboriginals, it’s an opportunity to climb the most famous rock in Australia, with the reward of incredible sweeping views of the desert plain. In the middle is the Australian Government. So far, the rock remains open to climb – some days. It’s often closed due to a variety of reasons (some say excuses) – wind, temperature, or by Anangu request. 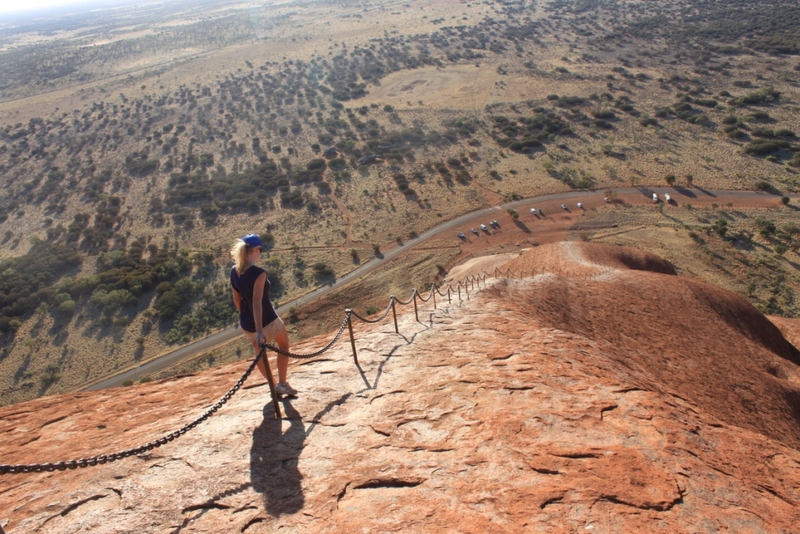 Many believe Uluru won’t remain open for climbing much longer. There are no signs showing you where to ascend, and the local park headquarters doesn’t even mention it unless you specifically ask. There is, however, a large sign listing the health risks of climbing, and warning that 35 people have died trying. We chose to climb. Without wishing to invoke the wrath of whatever Aboriginal spirits hang over the place, it’s just too tempting to pass up this once-in-a-lifetime opportunity. It’s a bloody tough walk. The route goes virtually straight up for the first 600m. There’s a chain you can grab to stop you slipping to your death. Your lungs ache, there’s no shade, and it’s over 30 degrees. But the elation at the top, 843m above sea level, is worth it. The views are incredible. Interestingly, there’s a plaque at the top describing it as Ayers Rock, a name used as little these days as Taranaki is called Mt Egmont. It was erected in 1973. It seems to me another indicator the Government is planning to shut Uluru in the not-too-distant future. If you’re keen on seeing what all the fuss is about, plan your trip there soon.